This is Kubuntu 17.10 Beta 1 "Artful Aardvark", a pre-release version available for development/testing purpose. For you regular users, you are not supposed to install Beta 1 version, unless you want to simply try it and report bugs to Kubuntu Developers. For you not installing I made this short review to see how amazing Kubuntu Artful is already! 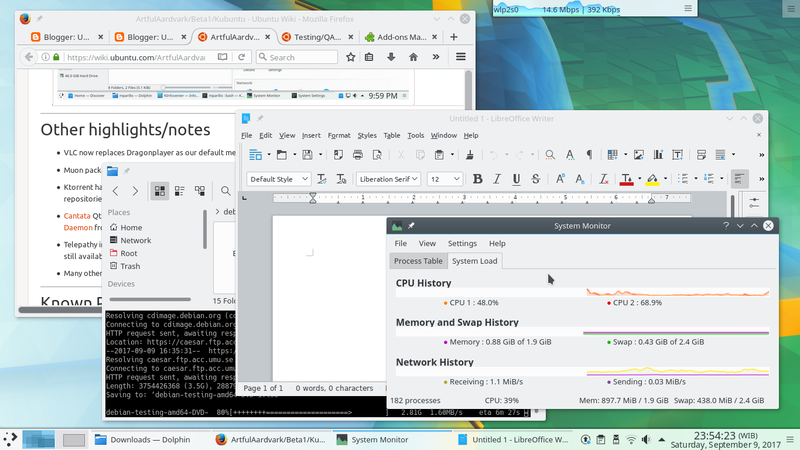 Kubuntu is an user-friendly operating system for desktop, with KDE Plasma as its interface over the Ubuntu base system, available for 32bit and 64bit computers. 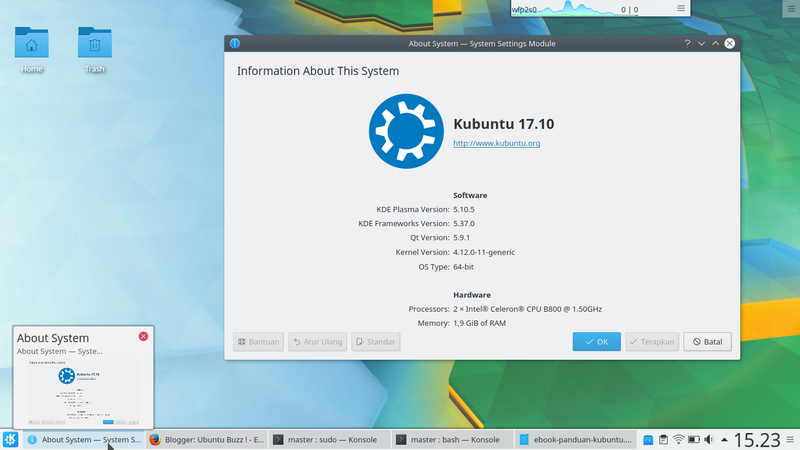 Kubuntu released every 6 month and the current stable release is 17.04 "Zesty Zapus". However, the current pre-release is 17.10 "Artful Aardvark" to be released at October 2017. Kubuntu is a GNU/Linux system developed by many people and you can get involved at Contribution Page. All about Kubuntu is available at its website https://kubuntu.org. I suggest you to use torrent to avoid the direct download. That's helping the Kubuntu server to reduce its load. It's only ±350MB! 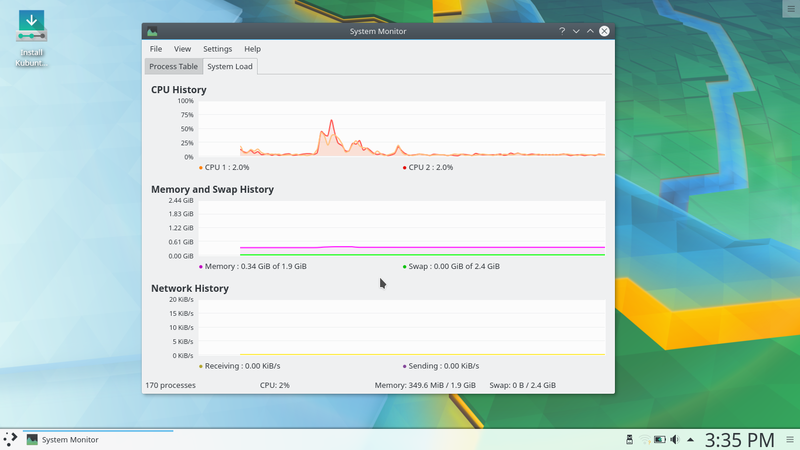 Compare it with Artful GNOME, where it eats up to 1.3GB at idle time, now you know Kubuntu is far better choice for low-specs computers. They're both very lightweight running on my 6-years old laptop ASUS X44C Celeron 1.8GHz 2GB. I can run Firefox, Dolphin, and LibreOffice Writer simultaneously without lagging at both sessions. This is a benefit over the Artful GNOME one, while I experienced heavy lag on both sessions running same set of programs. 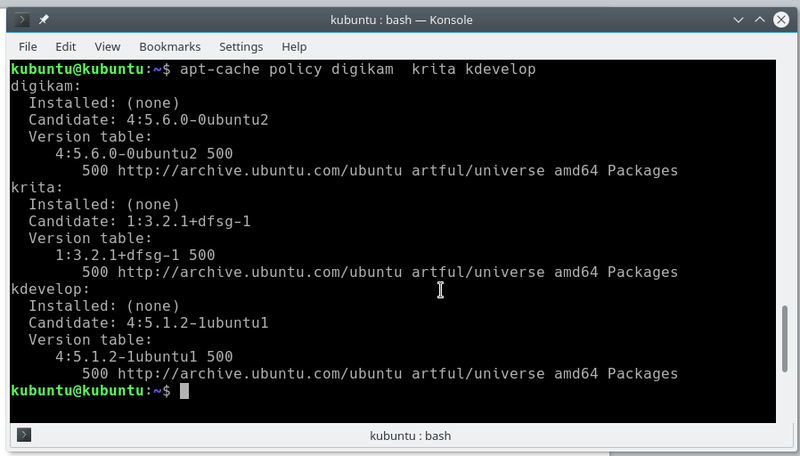 You'll like to use Kubuntu Artful better for both types of session. About LiveCD: it's a feature of Kubuntu so it can run as a complete operating system from CD, DVD, or USB booting without being installed. So you can browse internet, access disks, create documents directly from your USB drive without making change to the computer. 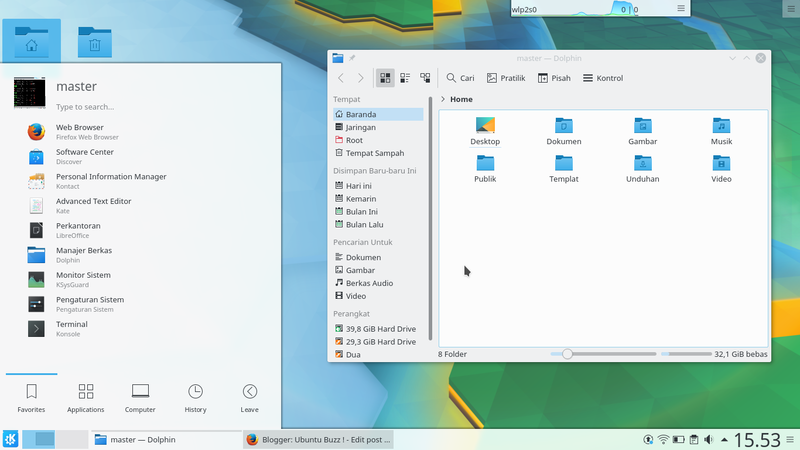 The latest Plasma 5.10.5 is the desktop of Kubuntu Artful. Read the KDE official announcement here. Read the Plasma 5.10 family release plan here. 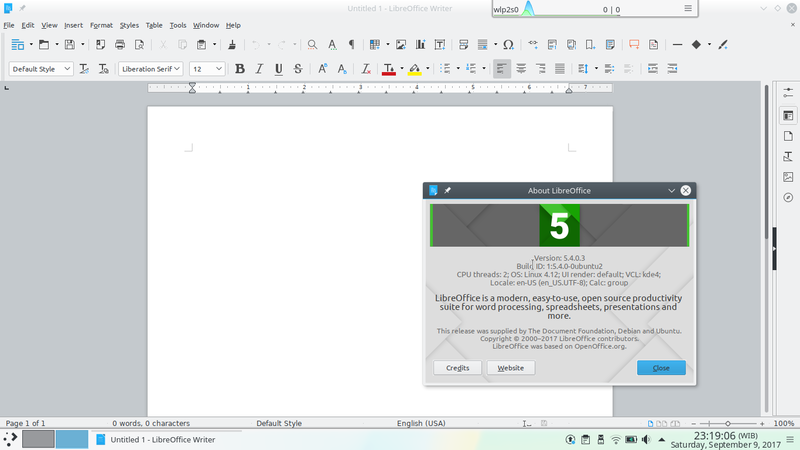 Kubuntu Artful includes LibreOffice 5.4 that is the current latest version. In brings the complete 6 modules namely Writer, Calc, Impress, Base, Draw, and Math. By installing Kubuntu, it means you read Microsoft Office documents and also produce professional text, presentation, and spreadsheet documents. 5. Latest Krita, digiKam, and KDevelop! The KDE Applications are upgraded to 17.04.3 following the KDE Project official release. 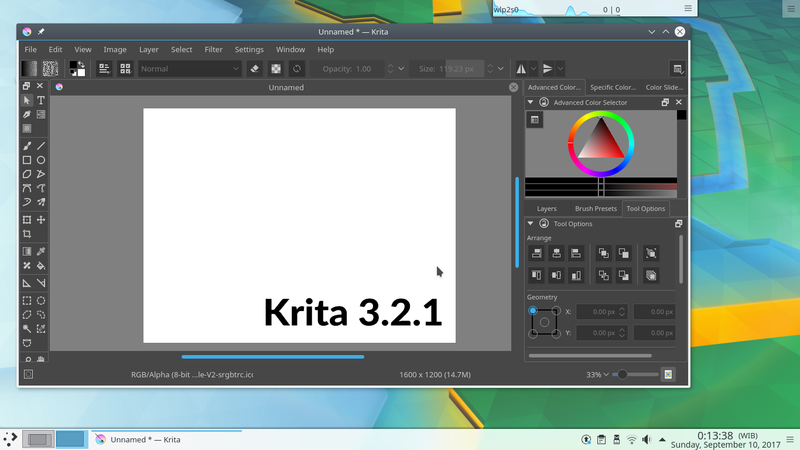 So, we can see that Krita, digiKam, and KDevelop upgraded to their latest version! You can install them after completely installed Kubuntu Artful. 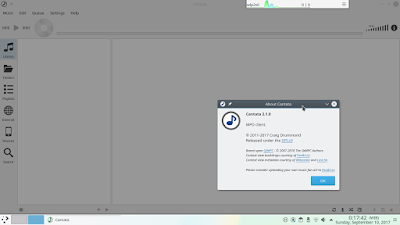 Kubuntu Artful uses Cantata as its audio player. This means the legendary Amarok is no longer default player. If Cantata is new for you (as for me, too), you'll need time to get accustomed to it. You need to place your MP3 files on certain folder and press Refresh Database to get it on Cantata, because the right-click > open with Cantata won't play them. Also, drag-n-drop MP3 from file manager is not working. For now, I see that Cantata is less-friendly and still hard to use on Kubuntu Artful. The good news is: Kubuntu Artful includes VLC as its video player. As you all knew, VLC is the best multimedia player that is user-friendly. 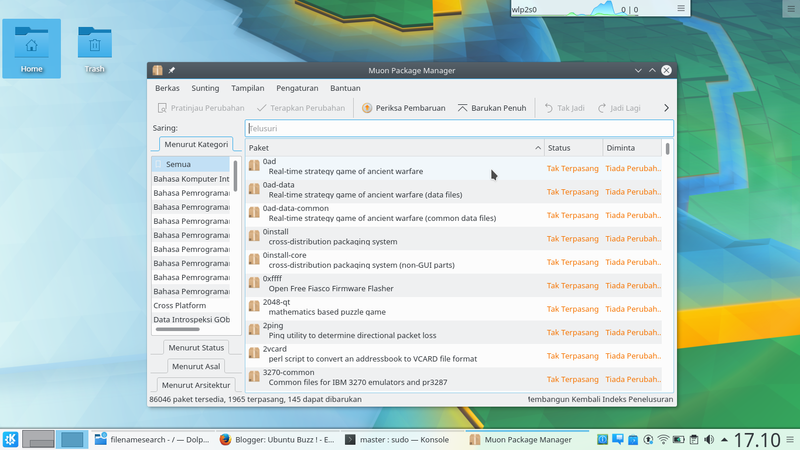 Kubuntu Artful includes (again) Muon to help you install software in more precise and easy way. Muon is an equivalent to Synaptic, with detailed information of each package and progress. 9. Seeing the QA Tracker! If you're interested to see the development of Kubuntu, the Tracker Page is a good representative. Here you can see how many bugs reported, what kind of problems occurred, and of course to report bugs you find.